The market for industrial gearboxes and geared motors in the collective region covering Europe, the Middle East and Africa (EMEA) is expected to decline by 4.2 percent this year as economic troubles continue to take their toll, according to the new report entitled "The World Market for Gearboxes and Geared Motors" from IMS Research, now part of IHS. 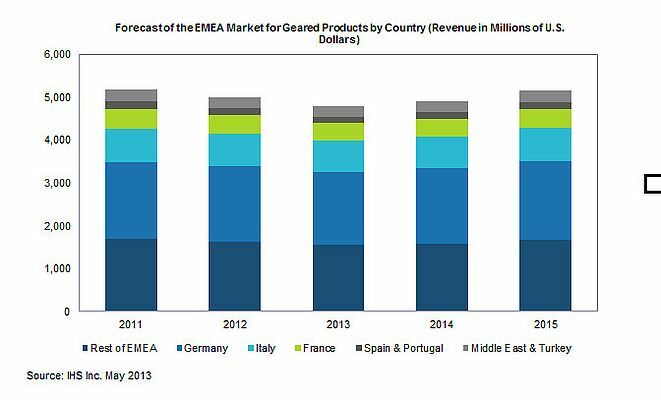 The EMEA market for industrial gearboxes and geared motors will fall to an estimated $4.9 billion by the end of 2013, down from the record-high level of almost $5.2 billion in 2011, as presented in the figure below. The market downturn stemmed in large part from the recession afflicting the Eurozone, which deepened in the second half of 2012. And no immediate end to the troubles can be glimpsed, as economic woes will continue to plague the region throughout 2013, according to IHS Global Insight. For industries representing the majority consumption of geared products, such as construction, mining and material handling, recovery is not predicted to begin until after the financial climate in Europe stabilizes. Revenue growth in EMEA for industrial geared products is then expected to slowly improve starting next year, with a projected 2.5 percent increase from levels this year. Even so, various reports point to a weak employment outlook for 2013 in the developed European countries, with Italy and Spain suffering some of the worst forecasts ever reported. "Until the EU banking system is capable of becoming more lenient in lending, companies based there will struggle when it comes to initiating large-scale, multiyear projects," said Paul Sundberg, analyst for motors and mechanical power transmission at IHS. "The ongoing debt crisis and the lack of a resolution-with Cyprus also affected in the most recent events-will continue to weigh down any efforts toward job growth. Because of this, the Eurozone jobless rate is likely to hit a record high of 11.9 percent this January, as projected by IHS Global Insight."